Get 200 MBs of Internet with Jazz Daily Social Recursive Offer in Just Rs.5. 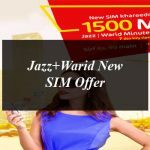 Mobilink Jazz the leading cellular operator in Pakistan is one again comes with the new and affordable offer for its customers in just Rs.5 daily. The offer is named as the Jazz Daily Social Recursive Offer that lets the customers of the cellular operator to enjoy Jazz Super 4G 200 MBs of internet for Facebook and WhatsApp daily in Rs.5. This is very much affordable offer from Jazz that lets you connected with you friends and family throughout the day with the Jazz Super 4G in just Rs. 5. How to Subscribe the Offer? This offer can be availed in just Rs.5 daily. This offer is valid for 24 hours after subscription. For more information visit the Mobilink Jazz official website.